Olly olly oxen free: It’s the phrase used in the game hide-and-seek to announce that it’s safe to come out of hiding. The organizers of the Hopewell Stampede had originally considered using that as the name for their contest that involves visiting – and logging in – each of the 68 artist-decorated oxen that will be on view throughout Hopewell and Pennington through Oct. 19. 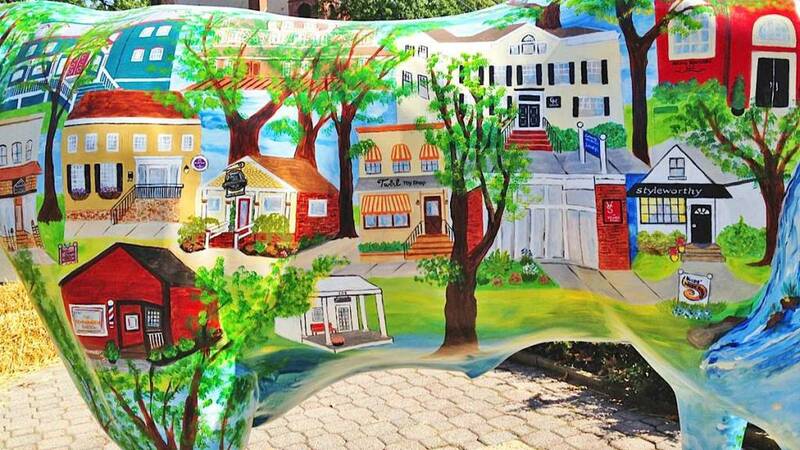 Bucks County had its mules, Princeton had its dogs, and now, to raise funds for the Hopewell Valley Arts Council and bring recognition to the region’s artists, Hopewell has its oxen, stationed alongside roads and at farm stands, parks and commercial plazas. For the Hopewell Stampede, as it is officially called, artists and community groups were given white fiberglass life-sized oxen in March. Beginning in mid August, the completed oxen began appearing throughout the Hopewell Valley. The oxen will be available for purchase through a silent online auction beginning Sept. 16. A “Stampede Oxtion Gala” will be held January 24, 2015, at Grounds For Sculpture in Hamilton. Hopewell has been the site of a real stampede in recent years, when hedge-fund-manager and executive recruiter-turned-farmers Jon and Robin McConaughy lead their cattle from one pasture to another. Sort of like Vermont in New Jersey, the Hopewell area has gently undulating hills punctuated by church steeples and a walkable downtown with shops, art galleries and a plethora of restaurants. It’s a designated historic district, and there’s even a gazebo where concerts are held. There are clusters of oxen that can be visited by walking or cycling, although to see all 68, a motor vehicle is practical. There are places to park near some, and while many can be appreciated at 45 mph, visitors want to stop and take pictures. To participate in the Where’s Olly contest (Olly olly oxen free was ultimately voted down as the name for the contest), visitors must scan the QR code on the plaque of each ox. To that end, the council has prepared a Cattle Drive touring map, also on the website, that follows a loop through all 68 oxen. There’s Beaux Vine, Floribundox and Spinning into the VortOX. At Howell Living History Farm, where live oxen roam, a painted ox is a tribute to the farming history of the region. On East Broad Street in Hopewell Borough, an ox painted by Diane Lufrano, depicts the streetscape of the town that evokes a bygone era: Nomad Pizza, Tomato Factory Antiques, The Peasant Grill, The Brothers Moon, the Hopewell Public Library, the Doll and Toy Museum, Brick Farm Market and Morpeth Gallery. And speak of Brick Farm Market, just across East Broad Street, it is the site of Agricolox, showing the golden fields of a late summer farm in Hopewell Valley, with a bounty of corn, tomatoes, zinnias and their winged pollinators. Artists Kit Greener and Kyle Wille originally met when their children played together in preschool, but became reacquainted when they signed up for a plein air painting class. They collaborated on Greetings from Hopewell Valley, an ox decorated with vintage postcards celebrating Hopewell’s farmland, river, people and history. They have even created a website, greetingsfromhv.com, that you can get to by scanning the QR code on one of the ox’s postcards. There, the history behind each postcard is explained. Another interesting tidbit about the history of the region is that the sole American distillery for Cointreau liqueur was located the Straube Center in Pennington from 1943 to 1967. The aroma of oranges was said to have filled the air. The Straube Center, a complex of office suites in the renovated distillery, also has a gallery and sculpture garden. The ox displayed here is a collage of vintage Cointreau ads. Lucky Lindy (Spirit of Hopewell), at the corner of Pennington Rocky Hill Road and Bailey Court in Hopewell, tells the story of Hopewell’s most famous resident, Charles Lindbergh, who completed the first, non-stop transatlantic flight as pilot of the Spirit of St. Louis in 1929. Lindbergh moved to Hopewell with his wife, Anne Morrow, and it remained their home until shortly after the highly sensationalized kidnapping and murder of their son. The artist, Chad Goerner, is himself a bit of a local celeb, having been the former and last Mayor of Princeton Township where he spearheaded the consolidation of the Borough and Township. Goerner now lives on a farm in Hopewell. So is it paradoxical to have a Stampede of fiberglass oxen in a region where the farming tradition continues to this day? Olly olly oxen free – the ox can come out of their hiding now.